A journey back in time is a short trip in Reidsville. Pull your car over at a little white building called Short Sugar’s, honk the horn (one tap, please), and a waitress will appear to guide you back to simpler times, when a perfect barbecue sandwich or hot dog was the difference between a good day and a bad one. He and his brothers, Johnny and Clyde, went on to build Overby Brothers Drive-In. But before the opening, Eldridge was killed in a car wreck. 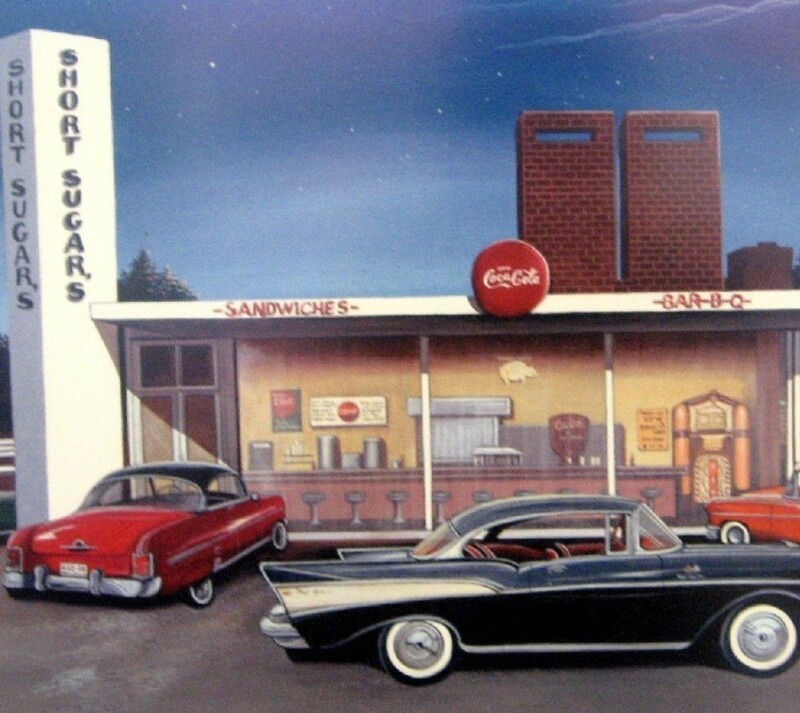 Johnny and Clyde decided to name the place after their departed brother, and Short Sugar’s Drive-In was born. Just about everything in the little white building is a relic of the past. Most of the action inside is back in the corner, where the barbecue finishes in a brick pit. Nothing fancy, just golden brown pork shoulders and hams, and an occasional shovel full of glowing coals. Orders for fries and onion rings are called out to the beat of a cleaver chopping each order of smoky barbecue. Pork is sliced with knives sharpened so many times that they look like crescent-shaped slivers of silver. The blade dances perilously close to thumb and fingers. Waitresses, juggling drinks and sandwiches, slip in and out of the door to waiting cars. Both the hungry and the just-fed occupy the stools by the counter, the tables and the line at the take-out counter. Conversation ranges from politics to college basketball to deer hunting, depending on the season. Back out on the drive-in side, folks eat in their cars. Whole families crammed into a vehicle, trading french fries for onion rings. A big, white Crown Vic wheels slowly into a space. Its driver, Margaret Allen, 95, is solo today, so she orders only one hot dog. At least once a week, her poodle Julie rides shotgun and gets a hot dog of her own. The waitress delivers Allen’s order to the car window. Allen counts out the exact change, then adds a tip. She puts her drink on the dashboard, sits back, slowly unwrapping her lunch. She’s in no hurry, just enjoying a hot dog and cheating time at Short Sugar’s.